1. Still can’t believe it. Feel so sorry for your loss. Your mother was a great woman and I want you to know that I loved her as much as I love you. 2. Just don’t know what to say. I believe that these moments must be with no words. Just feelings of love. Really sorry for your loss. 3. If there is another place, a good one, this great lady will watch us now, and want you to be happy and full of love she gave to you. 4. I remember her face, her smile, even her cigarettes. Still can’t believe this loss. 5. You have to be strong. I know it’s too difficult. Your moments are around your mind all the time, but listen, you have to keep them, for her. To be alive in your heart forever. 6. Your mother was the mother everyone would like to have. Just remember that. My condolences for your loss. 7. Look up the sky after the rain. Sure she will be there. Colorful and pretty like the rainbow. Free like birds. 8. We’ ll never forget her smile, her kindness , her hug, her. So sorry for your loss. 9. There are coming difficult days, but you need to be optimist. Pain for this loss never goes away, but at least you’ ll keep her love in your heart. 10. Like the last light when the sun goes down.. My condolences for your loss. 11. There is no precious person in the world than mother. I totally understand what you’ve being through and I’ll stand by your side. 12. I remember how much she used to love us, and take care of us, and be there for all of us. That loss came too early. So sorry. 13. Once she told me, if everything happens to her, just remind you how much she loves you. Hope to be strong. My condolences my friend. 14. This really hard moment, think about her life, the love she gave, the love she was given, and after the rain passes, just smile. For her. 15. Your mother was a gift to everyone ever met her. Sorry for your loss. 16. I know she can’t be replaced. I know you’ll miss her to the moon and back. I ‘ve already know how you feel. But I assure you that love never dies. 17. I wish I could take your sorrow away, very far from here, and bring you all the smiles and hugs. Like your mother did all these years. 18. Your mother was a friend, a mother, a worker, a wife, a soldier of life. She deserves to be remembered exactly like that. My condolences. 19. I am so grateful that I met your mother. She taught me to be strong. 20. It’s too difficult I know. But she will be everywhere. In your house being sure you sleep safe, in your morning walks, in your difficulties smiling to you. In your heart. 21. Now she’s gone , she found a better and safer place to live. Your heart. 22. Remember telling you your mother was always laughing. Such a pure soul. Hate for no one love for everyone. My condolences. 23. I remember, when my mother left, she took my hand and told me “I’m here”. Such a great lady. 24. I keep thinking of this bad news, when you fisrt told me, your tears, your confess, and it might be not helpful for you to remember all these, but you have to face it. This is the only way to get over the loss, and keep her in your heart and mind forever. 25. You have to think that she was suffering, because she was not meant to be in this cruel world. She deserves a throne between the angels. 26. Please accept our most sincere condolences in this trying time for you and your family. No loss is greater than the loss of a mother. We share your pain and are here for you. 27. Your mother was the loveliest woman we have met, and the news of her passing shook us all. Condolences from our family to yours. 28. The loss of your mother is nothing short of tragic. I am so sorry to hear this devastating news and I hope you and your family keep the faith during these painful times. 29. Losing a mother is heartbreaking and excruciating. I offer my condolences and I am here for you and your family. 30. I am so sorry to hear about the loss of your mother. She was a unique angel who will now come to your dreams and guide you from heavens. Stay strong. 31. An illness snick up on your mother and took her life, but her vibrant spirit will always follow you and your family! Keep the memory alive, and may you find the solace you need. 32. When souls are done with the physical world, they tend to stay with us, making sure we are safe and loved even from heavens. I am devastated to hear of your mother’s passing and I’m sending my deepest condolences. 33. May your mother rest in peace, and may she always guide your way in life. Losing a parent is never easy, may you find comfort in the lovely memories you had shared with your mom. 34. Young or old, losing mother pains and stings unlike anything else. Please accept my sincere condolences and send much love to your family. 35. A child will never find a greater love than his mother’s. Today we have lost an exceptional woman, but her spirit will remain to live deep within us. 36. The grief you are feeling is shared by everyone. 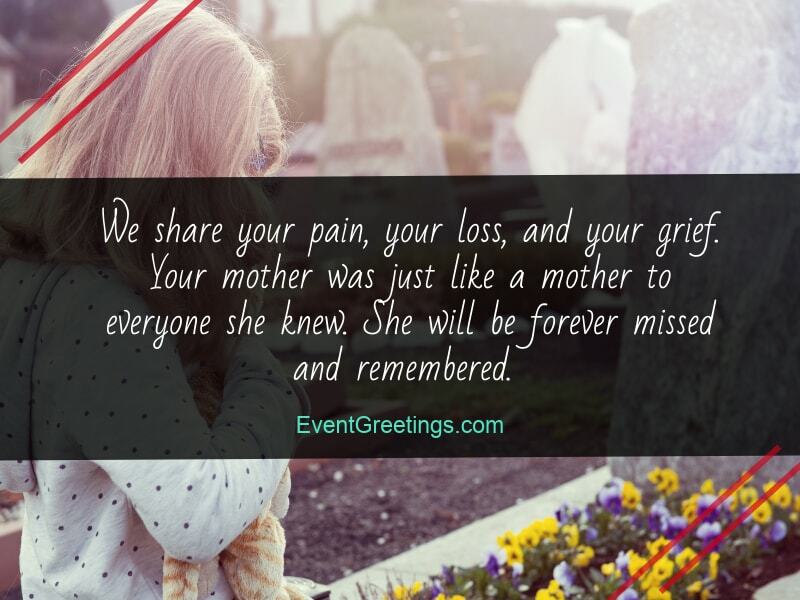 Losing your mother has fallen heavy on our hearts, and we are here for you and your family. 37. When a person is as divine as your mother was, God recognizes it and takes them to be his faithful angels. May your mother rest in peace, please accept our condolences. 38. Hearing of your mother’s departure has forever left a hole in my heart. Please find comfort in knowing that your mom will always be by your side. Accept our most profound condolences. 39. I understand your sorrow and I wish I could do anything to get her back. Losing a mother is excruciatingly painful, but hopefully, you’ll find solace in the loving memory of her. 40. It’s devastating to hear about your mom’s passing after being ill for so long. I extend my deepest sympathies to your whole family. Please find solace in knowing she can never be hurt again. 41. The news of your mother’s passing has shattered us all. Stay strong and remember the way she lived every single day! 42. Your mother was a ray of sunshine in a workplace in need of one. Accept our deepest condolences, we are terribly sorry for your loss. 43. Your mother has been my friend ever since we first moved into this neighborhood, and her departure has left me agonizingly sad. Sending love and support to your family. 44. We are terribly shaken to learn your mother had passed on. Although there is no adequate comfort, I hope her spirit is always by your side, looking over your family. 45. The pain of losing a mother is excruciating and I feel your pain. Our deepest sympathies go to you and your family. 46. The passing of your mother will never stop stinging. I am so sorry for your loss and I hope you find solace in the love that surrounds you. 47. 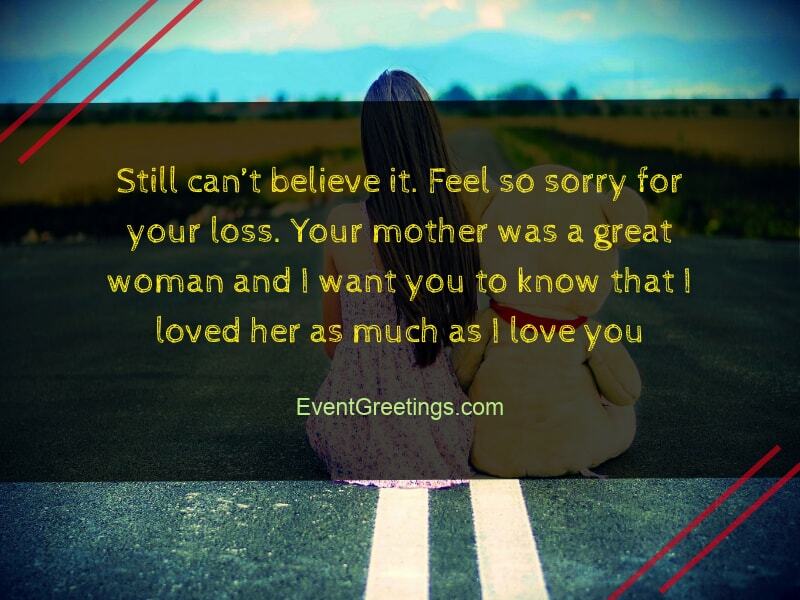 It is devastating to learn about your mom’s departure. May you find the strength to endure during this challenging period. 48. May your mom rest in peace, she will be terribly missed by everyone who knew her. Please send our sympathies to your entire family. 49. There are times to cry and feel heartbroken. Losing your mom certainly calls for both. I hope you and your family find strength and faith to push through these difficult moments. 50. We share your pain, your loss, and your grief. Your mother was just like a mother to everyone she knew. She will be forever missed and remembered. 51. 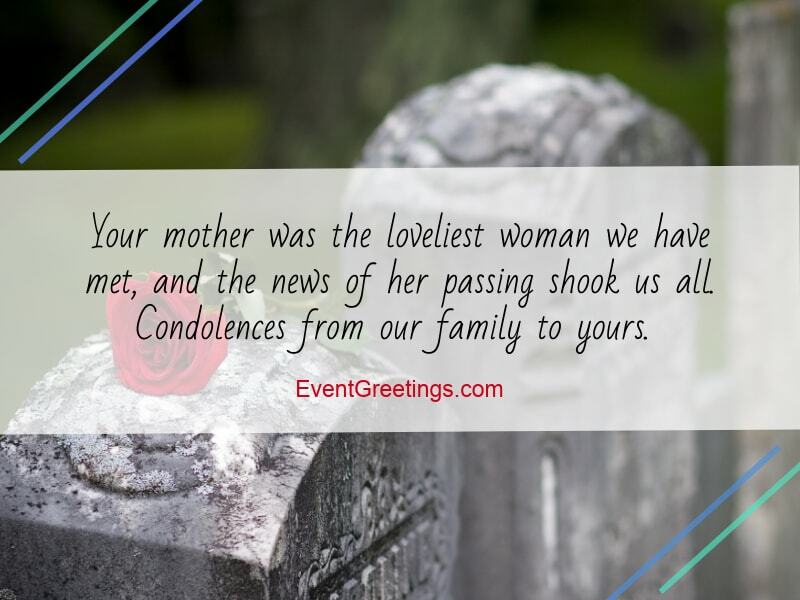 We offer our most profound condolences following your mother’s passing. Take one day at a time and remember her bright spirit with each passing day. 52. It is terribly saddening to hear your mom has passed, and I am certain she is in a place of no more pain, or worries. Please find comfort in knowing your mother will always guide you in spirit. 53. 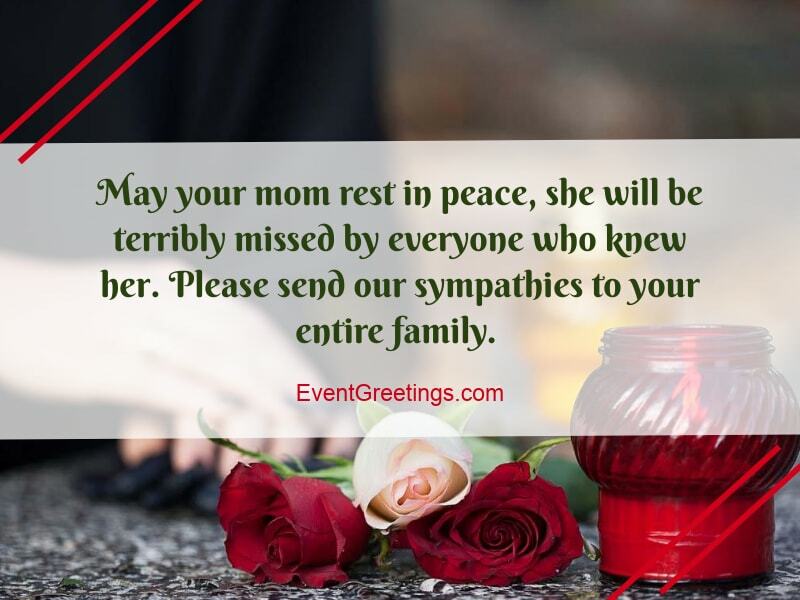 Accept our most sincere condolences, following the passing of your mom. We are here for you and your family, and we are sending plenty of love. 54. Your mom was the best aunt and friend we ever had, and her presence will be missed with each day that goes by. Sending our condolences to your dad and siblings, we love you dearly! 55. Death is a physical departure from the body but an everlasting presence of the soul. Accept our deepest sympathies and may your mom rest in peace.